I carry a uv flashlight just to check the area. If none in the area, Ill give it a try. If I find one, I normally find more in the area. Time to move on. I've spent many nights in the Bend sleeping under the stars with no horrors to report, except for the night it poured down rain at 4 a.m. All those creepy crawlies out there are looking for prey much smaller than you. I love just throwing a bivy! I carry a lightweight tarp to build a rain/windbreak if I need it, but usually just throw a strip of tyvek, use my pack as a pillow with my top quilt. Only once did I wake with a daddy long legs on my face - no biggie, felt like a feather on my face. You just creeped me out! It is common south of the border and is considered rare in the southern US. I go tentless most of the time. The exception is if I am expecting heavy rain or uncertain about the presence of fire ants. 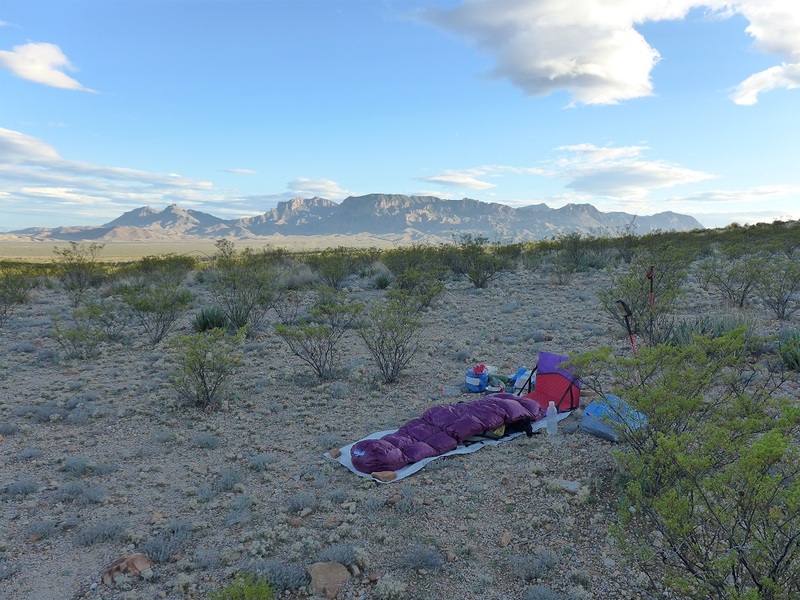 I was surprised to have a few mosquitos buzz me while I slept on a plateau near Mule Ears Spring. It was too warm to pull my bag over me so I draped a shirt over my face and it keep them at bay. I woul NOT adding bug netting to my Big Bend packing list. I also read for a few hours each night so my light tends to attract insects. During the summer snakes will move around at night and when it is cooler they will mve around during the day. When it is cold they will not move at all. Your biggest risk would be going for a leak at night and stepping on one. But that is there with or without a tent. Even during the summer, I think it is an irrational fear... but always check your boots and shake out your bag if it has been unattended for a long period. . There is something liberating about not having a tent. Also, making and breaking camp is easier/ faster. When you climb in a shelter at night you kinda leave the park. I love sitting on my bag and matt while I have dinner and take everything in. A big ground tarp is nice. You can stretch out a bit. Totally agree with both Hunter and AGC! ME's bag rocks! Superlight. Thanks for the heads-up, Hunter. I need to dig up and send photos of my semi-rectangular WM Mitylite. I use it as my summer bag, and as an overbag in winter, slipped over my Feathered Friends Winter Wren when the temps drop into single digits. There are some exceptions but it seems most have no issues with cowboy camping in the desert. It looks like a tent gets more use in wooded areas, especially during summer time. Ticks, chiggers and other annoying insects being the main reason.